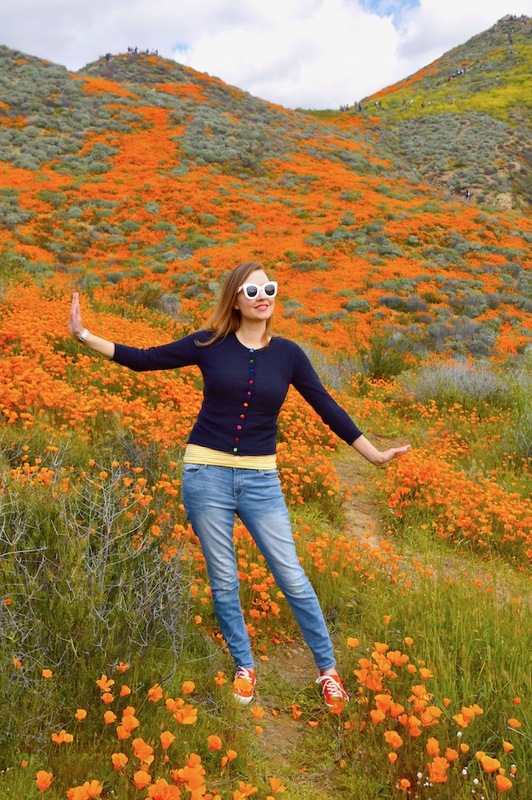 Hello Katie Girl: The Hills Are Alive With Poppies! 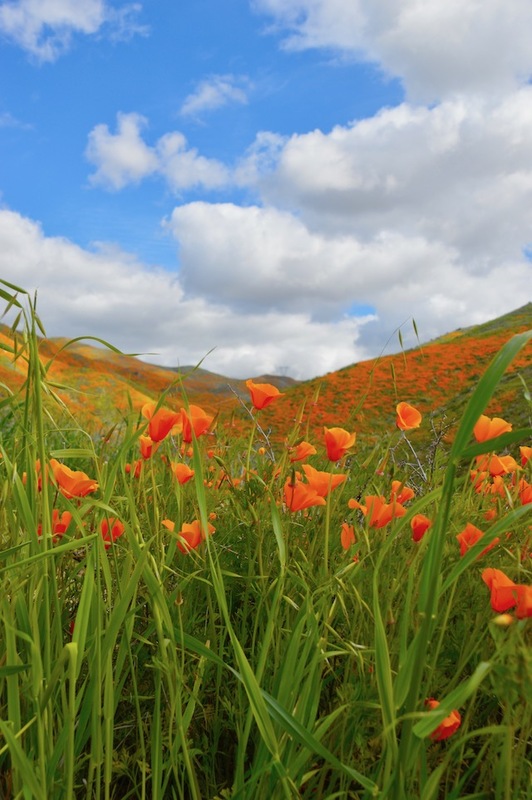 The Hills Are Alive With Poppies! I feel a little like Julie Andrews singing "The Hills are Alive with the Sound of Music!" 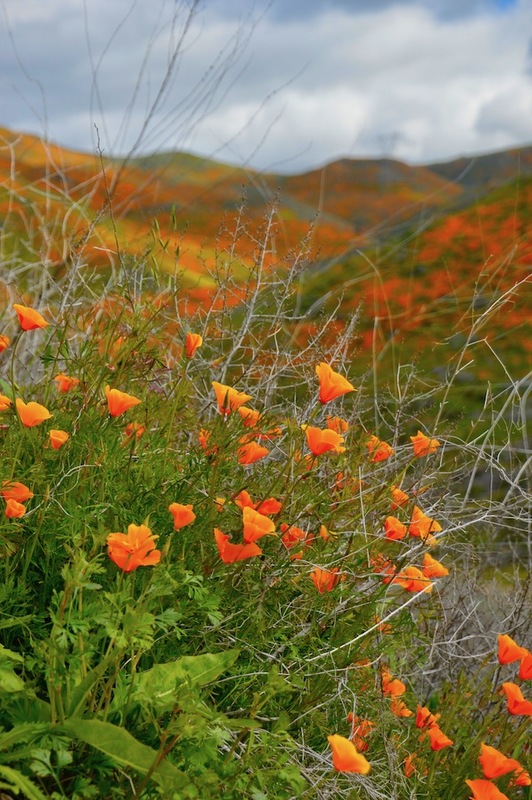 in this picture, except that, in this instance, the hills are alive with the vibrant hues of orange poppies! Also, instead of being in Austria, I'm actually in Lake Elsinore, California! 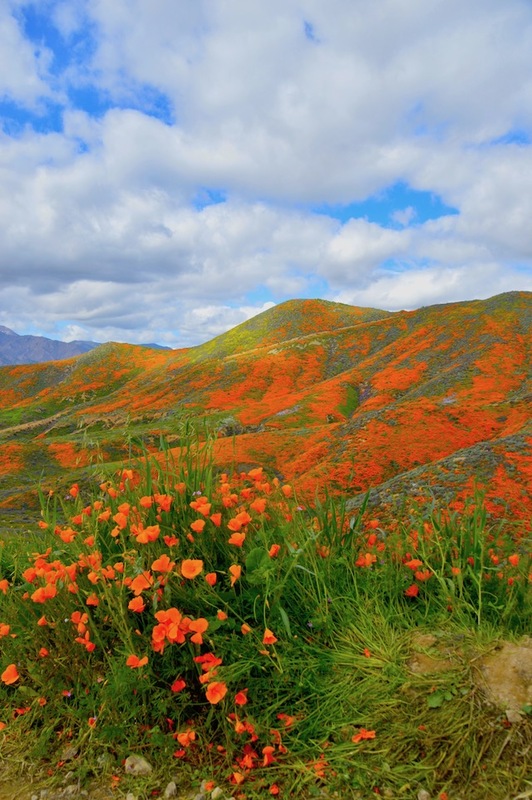 Regardless, my heart can't help but fill with glee at the sight of these glorious flowers that are literally covering the hills in this area of Southern California! It's definitely enough to make anyone spontaneously break into song and dance, as it's truly a sight to behold. It also reminds me why many people think California is, perhaps, the most beautiful place in the world. 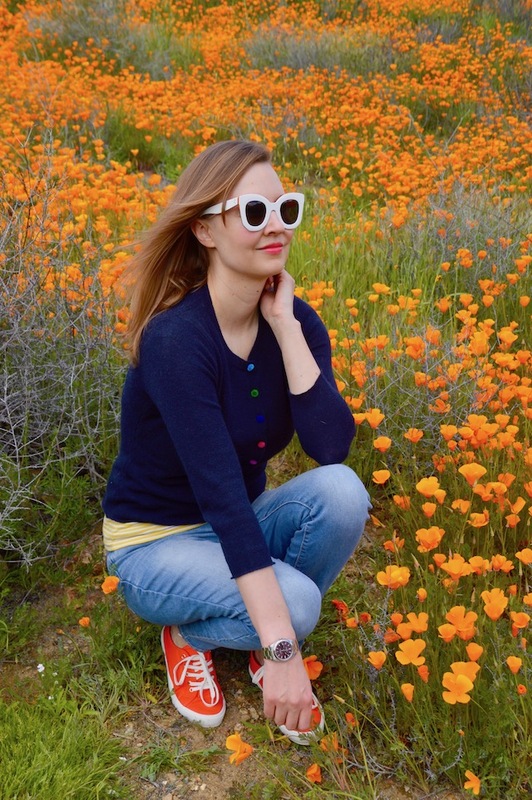 Seeing all of these delightful flowers also made me feel a little like William Wordsworth in his famous poem "I Wandered Lonely as a Cloud" in which the lonely poet stumbles across a field of daffodils that not only cheer him up but also prove to be a wealth of creative inspiration. Again, there's one key difference between my experience and Wordsworth's, namely that Wordsworth didn't have to deal with 50,000 people crowds in the Lake District, all of who were trying to snap that perfect picture for Instagram and who contributed to insane traffic! 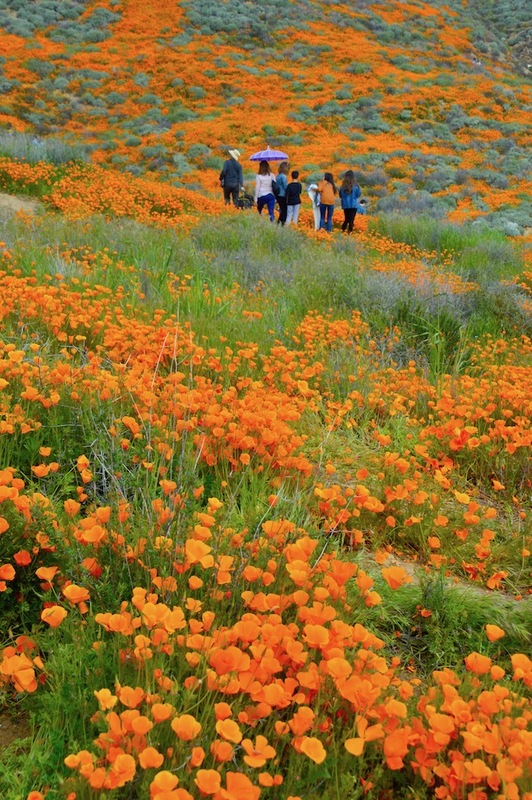 Apparently, the crowds this weekend in the poppy fields were so bad that they've declared the area a "public safety crisis"! It makes me glad that I went last weekend when there were a mere 25,000 visitors! Well, hopefully these pictures make the experience appear, at least on the surface, to be calm and tranquil! 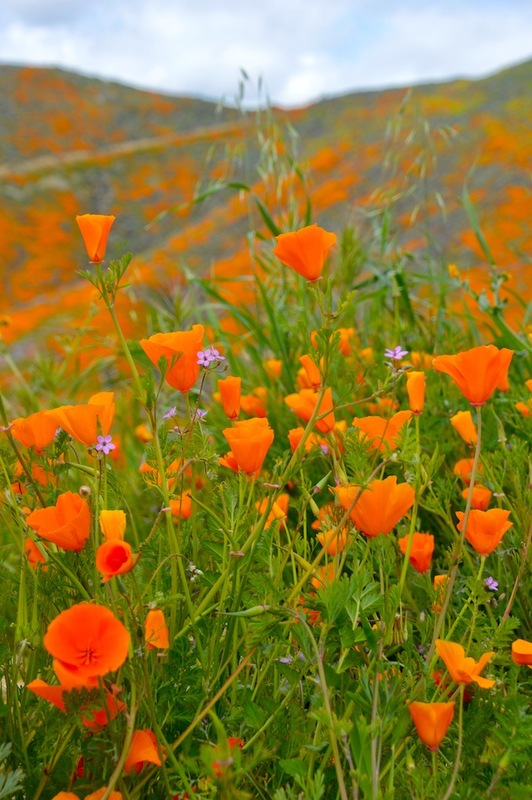 Also, I can truly say that no poppies were injured in the taking of these pictures, as that has become a major concern with the massive crowds that are descending on the area. Overall, it was a really lovely experience and the views are, obviously, breathtaking. I have to say, however, that I find looking at the pictures to be much more relaxing than the actual experience but this will surely be a memory I will never forget and that will inspire me for years to come! Bag: Clare V. similar striped bag from Clare V.
Wow! I don't think I've ever seen so many! So pretty, I'd love to visit! wow! how beautiful! 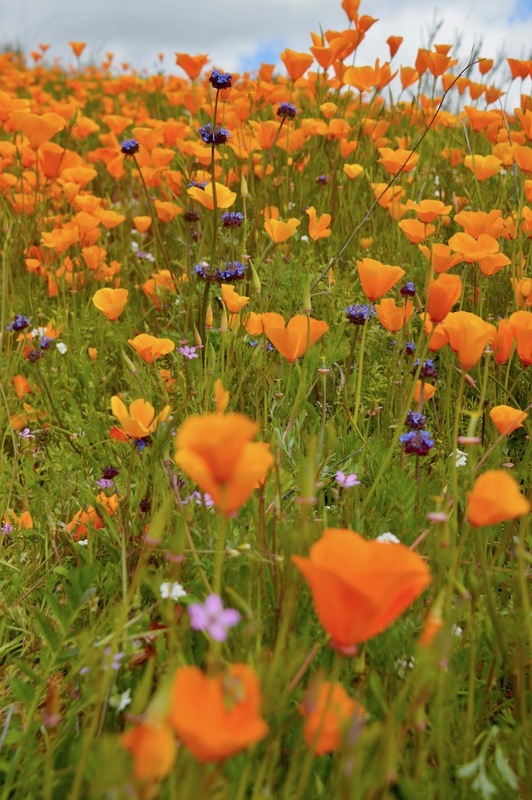 i have never seen so many and it sure rivals fields of lavender and sunflowers in france! and you fit right in with your colorful outfit! Wow this is just breathtaking! 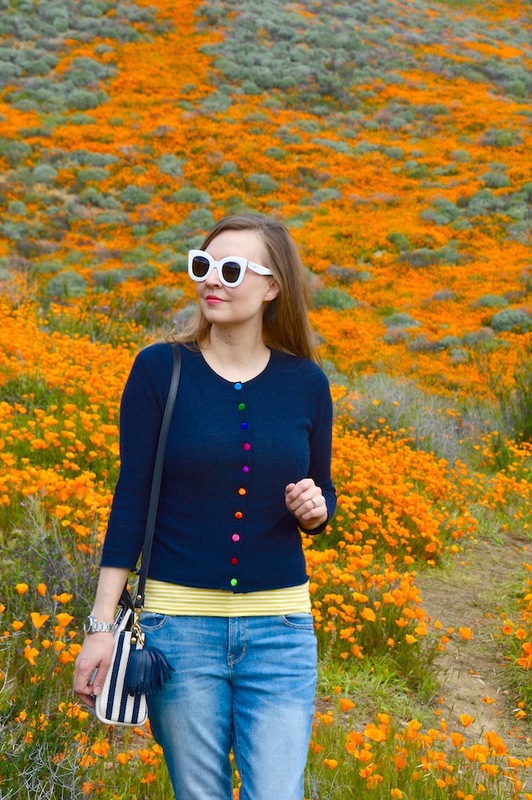 I love the poppys and your pics! Sooo cool! I've been seeing these photos everywhere and for some reason, just found out about this place recently! I really want to go but my husband's not that into it...lol. I'd also have to bring my toddler and I'm not sure that's a good idea! I absolutely love these photos! They are so beautiful! 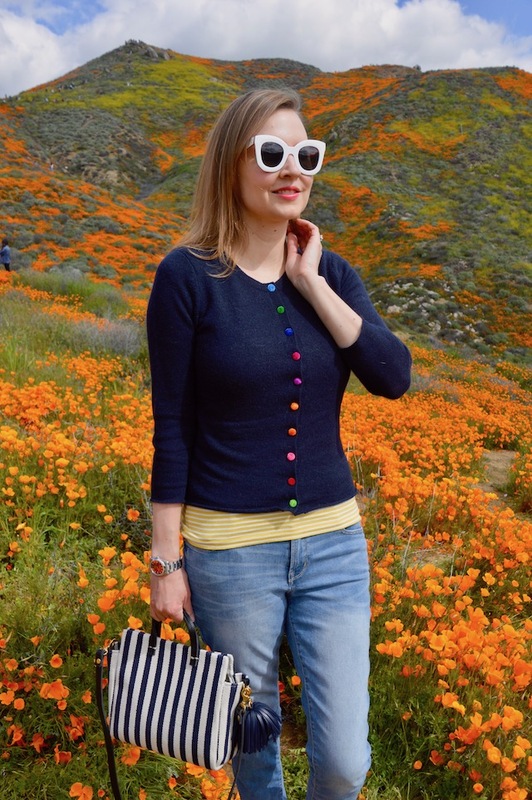 Your navy cardigan is really fun too! I saw on the news that they were becoming so popular that they had to close the area on certain days! 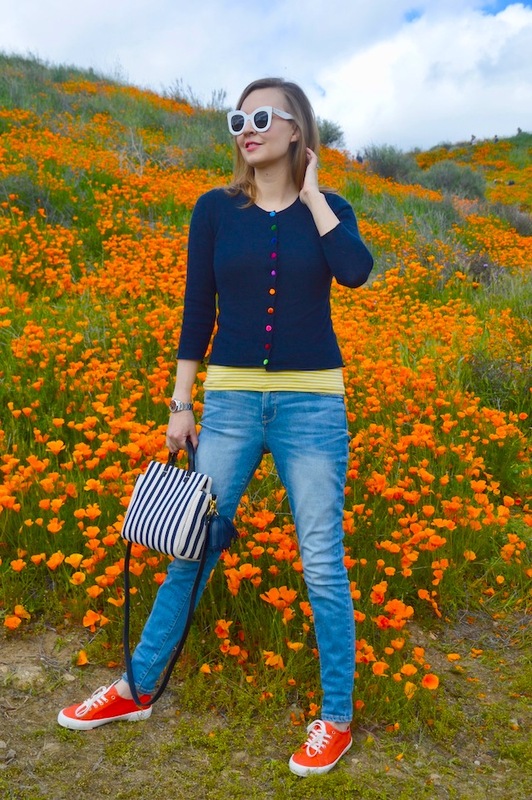 Love your striped bag and the buttons on your cardi. It must have been something to see !